The U.S. Army Corps of Engineers (USACE) selected Black & Veatch as the design engineer for the McCook Reservoir Main Tunnel. The new tunnel will connect the future McCook Reservoir to Chicago’s Deep Tunnel system, which is aimed at improving water quality in area rivers and Lake Michigan and reducing flood risk for the city of Chicago and suburban communities. 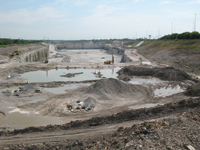 The project is a key component of Chicago’s Tunnel and Reservoir Plan (TARP). Through TARP, the Metropolitan Water Reclamation District of Greater Chicago (MWRDGC) collects and diverts combined sewer overflows and floodwaters throughout metropolitan Chicago to temporary holding reservoirs before treatment. When completed, the tunnel will connect Chicago’s Mainstream Tunnel to the planned McCook Reservoir and bolster protection of the local water supply. “Experts in our core business practice groups of tunneling, dams, levees and reservoirs – as well as Black & Veatch’s Federal Services Division – are an integral part of the USACE and MWRDGC project team and are fully engaged in bringing this project to fruition,” said Faruk Oksuz, associate vice president and Black & Veatch National Practice Leader for Dams, Levees and Reservoirs. In addition to the main gates and connection tunnel system for McCook Reservoir, the global engineering, consulting and construction company is also leading the design for the groundwater protection system and the Thorn Creek connection tunnel, and is leading the final preparations for the Thornton Composite Reservoir. The projected construction costs for all facilities Black & Veatch is designing in conjunction with TARP are estimated to be more than $500 million.